It can sometimes feel like 21st century history is being written by a handful of entrepreneurs and their organizations: chances are that generations to come will talk of Elon Musk in the same way that we remember Henry Ford, who famously said, “The remains of the old must be decently laid away; the path of the new prepared. That is the difference between revolution and progress.” Both are visionaries who have changed the way we think about vehicle manufacture and performance, and each has embraced the spirit of their time and applied it to their business and engineering strategies. But while Ford is by now an established historical figure, Musk is still living out his story. Of course, bubbles have burst before, and we’ve seen many a hubristic entrepreneur wade too deep into a river of their own hype; but like Ford before him, Musk’s success – and his potential – rests on his informed vision of not just how the world will look tomorrow or next year, but in ten, twenty, or fifty years time. Tesla’s lithium-ion battery ‘Gigafactory’, for example, will be powered by 100% renewable energy – remarkable, considering it will be the second-largest building in the world. 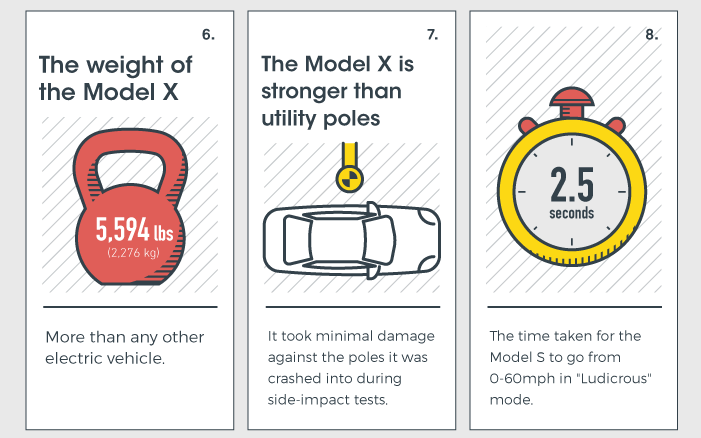 Such scale, vision, and conscientiousness is why Tesla is a major, major company to keep an eye on – and you can begin by checking out some of the startling facts and figures in this smart new infographic.